Hiiiiiiiiiiiiiiiiiii. Remember the part where I write a music blog? I forgot about that for a while. But I'm happy to be back! 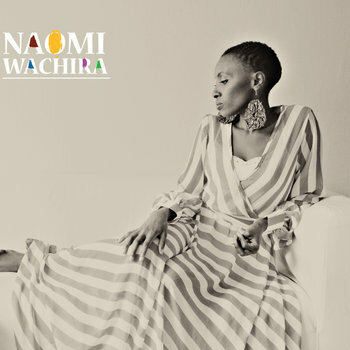 And I'm really happy to introduce you to Naomi Wachira. She surrounds herself with folk musicians like Damien Jurado, but I wouldn't call her music folk per se. There's certainly good, honest songwriting on her sophomore album. There's an acoustic guitar. And it's not that the combination of those elements with a reggae bass and (West) African-influenced rhythms make it not folk. I'd say that Wachira's music pierces to the heart of things and therefore it transcends any classification. This album speaks to me. It's about the hungers and pains and joy of youth, or as my dad liked to remind me these last two weeks (with an obnoxious smirk) the "vicissitudes of life." So maybe this isn't meant for confused twentysomethings. Maybe it's also good for confused sixtysomethings. But it's really about not settling for less. Don't shy away from Wachira's feminist and postcolonial critiques. We're all made to feel less than we are sometimes (as Wachira points out, for women of color that "sometimes" is "all the time.") Wachira reminds us never to second-guess ourselves. Life is what you make of it, so dive right in. PS -- CXCW 2014 has started! See the best of what the couches of Ameriva have to offer in folk, country, and who knows what else.